The question of how to make an adapter vga to Tulip, today more popular than ever. Many people like the idea of connecting a TV to your computer. And this makes a lot of speculation. On the Internet you will find ready vga Tulip, but unfortunately, even if you buy it, it won't work. For transmitting the composite signal from the computer to the TV requires that the video card has to support this kind of standard signal. Until 2000, released video cards that support tv-out over d-sub. That is do to a video card you could connect the TV via the vga adapter is a Tulip. However, after 2000, the transmission standard signals have been changed, and the video card has ceased to transmit a composite signal. Therefore, if you make an adapter vga to Tulip or buy ready-made and try to use it on a modern video card, the adapter will not work under any circumstances. 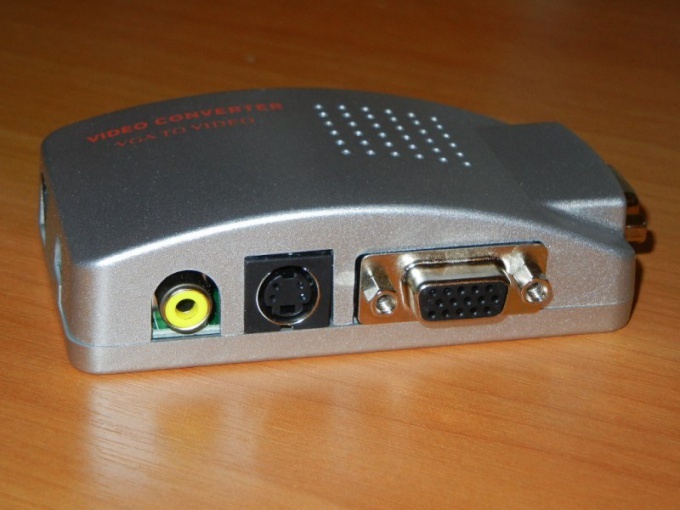 If you still need to display the signal from vga output of a modern video card through the composite input on the TV (yellow video Tulip), then the only way to do this is to purchase a special device - a Converter. It carries out a transcoding of the signal between the different standards. The cost of this Converter ranges from 10 to 20$. This is quite a complex device to assemble it yourself only professional. If you happen to have an ancient graphics card (edition 2000) which supports tv-out over d-sub, such as the company Matrox, you can try to make an adapter vga to cinch yourself. For that you need the connection scheme of the rca and d-sub or "Pinout". Prepare vga and cinch to solder. Open the protective housing, apply flux to the desired contact pads in accordance with the Pinout. Take pieces of cable of the desired length, strip the ends, saladita them. Be sure to replace the connector body on the cable before you solder it to the connectors. Solder the inner core of the cable to the Central contact area of the contact Tulip and a contact number 3 of the vga connector. Solder the shield conductor of the cable (braid) to the other contact of the contact Tulip and a contact number 8 on the vga connector on the other side of the cable. 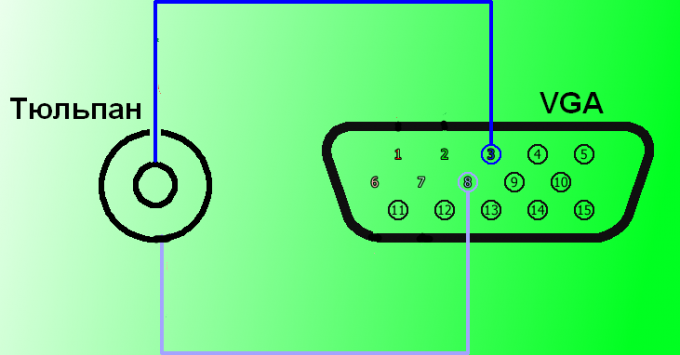 Assemble connectors on both cable ends. The adapter is ready. You can try to connect the TV to the computer. Pay special attention to the setting of the signal format, resolution and razerzone. Start with the lowest values. The TV may not recognize the video signal under most combinations of these parameters, so try different options. The easiest way to connect a TV to your computer - video card with a separate tv-out, cinch or s-video. You can also use the Converter. - connect through adapter vga SCART. The same as in the previous paragraph, but the TV must have SCART input (comb).